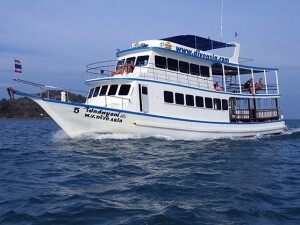 Diving Phuket with MV Dive Asia – A dive boat that would like to extend a very warm welcome to all of Dive Phuket Today guests and we would like to offer you a safe and comfortable dive boat for your Day Diving. She has a spacious lounge, large covered/open sun deck, a comfortable dining area where you will enjoy Thai/International meals, and a well-designed dive platform for easy water entry and exit. Your safety and enjoyment is our guarantee! The price includes all transfers to and from the boat from your specified hotel or accommodations. Most transfers are all inclusive, however some areas, due to their location, have a surcharge. The price for the course, manual, certification fee, Instructor, boat trip, equipment rental, tanks and weights are also covered in the package.